I absolutely love to receive the photos of your doll clothes made from my patterns so it’s time for my October customer photo update. 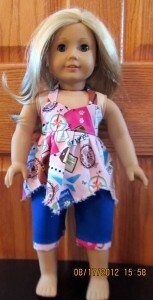 Mary Ann hadn’t touched a sewing machine in more than 30 years, but with my video course and a new sewing machine she is turning out some very nice doll clothes! The colors in the halter top and sarong below are simply gorgeous. 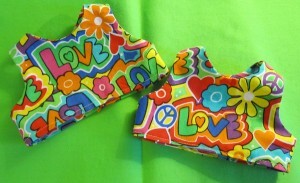 I am so glad you are enjoying sewing again Mary Ann. 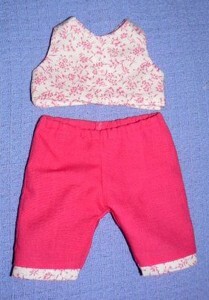 Claudia has also been enjoying my How to Make Doll Clothes course and has sent in photos of her first project. The crop top and shorts are so cute and I love the way she has ensured the word ‘love’ is in the centre front of the crop top. She is hoping to make the witch costume next and so I look forward to receiving more photos soon. 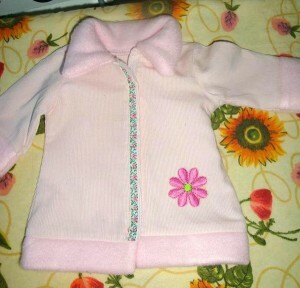 As you can see from the photos below, Crystal has been very busy sewing doll clothes for her daughter and niece. This is only some of the huge collection Crystal has made but if you would like to see more of Crystals lovely outfits, please visit my Facebook page and go to my Happy Customer photo album. She really has done a fantastic job! 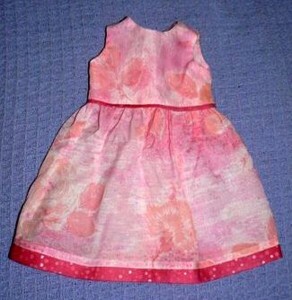 Noreen has sent me in some photos of her first attempt at making doll’s clothes for her granddaughter’s Matilda doll (Australian Girl doll). She used up some scraps of material that were hiding in her sewing table cupboard and hopes to use up many more. I’m sure her granddaughter is delighted and can’t wait to see what her grandmother will make next! Well done Noreen. 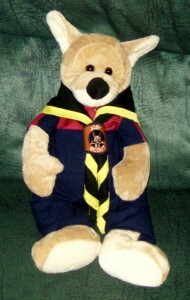 Judy has been very creative and adjusted my Winter Pyjama pattern to make a scouts uniform for her Joey Scouts mascot, Russell. 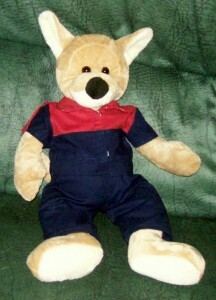 I think Judy has done a terrific job especially with the contrasting panels on the shirt….it is so cute! Sharon has been busy with a sewing project making lots and lots (78 in total) doll clothes to send to her granddaughter for her birthday. We saw some photos in an earlier blog and the photos below show some of the last items made before wrapping them all up and posting them off to the US. 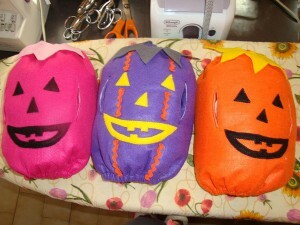 I love the colors and added trimming on the purple pumpkin costume. The Fur trimmed jacket looks so sweet with the trimming down the front and the embroidered flower. I’m sure your granddaughter will be thrilled to receive her parcel. 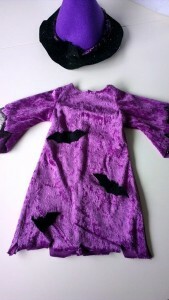 The last photo is from Hayley and she has also been getting ready for Halloween and made this terrific Witch costume for her doll. From the number of Witch doll clothes patterns I have sold this year, I’m sure there are going to be lots of witches out and about on Halloween so remember to carry lots of candy with you or risk having a spell cast on you! Phew! 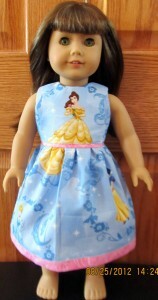 Looks like there have been a lot of very busy people out there sewing for their dolls. Thanks to everyone who has sent their photos in, I know everybody else loves to see what you have made. I have a special promotion coming up next month so if you have been thinking about buying my How to Make Doll Clothes course either on line or on DVD, be sure to keep your eyes out for the exciting news in the next week! Beautiful and great ideas there..I’ll bet they were just as much fun to make as the littlies will have playing with them. 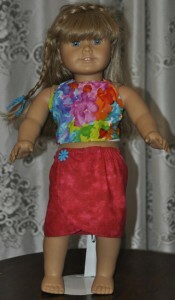 These doll clothes are so colorful. I love that you show them to us. Keep on sewing. 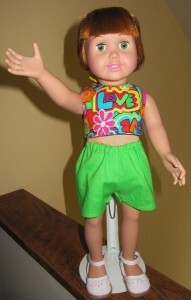 PS I am headed to the USA and am bringing the doll clothes, plus I bought my granddaughter a sewing machine! Sharon, that is fantastic news. You’re going to have such a wonderful time teaching your granddaughter how to sew her very own doll clothes on her very own sewing machine…these will be memories you will cherish forever. Have an awesome time in the US with your family.